I can't get the shutter to fire. Lens looks ok from the front. No other testing was done for parts or repair. Kowa SETR f/1.9 50mm Lens (HAS PROBLEM). 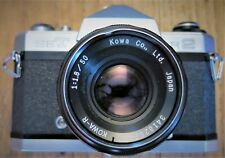 Kowa Ser f/4 135mm Lens #147234. Kowa lens hood. New Batteries. APERTURE BLADES NOT CLOSING QUICKLY. 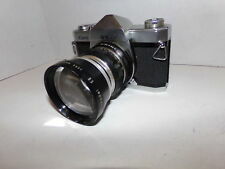 Kowa 1:1.9 f 50mm lens included. Lens serial number 544289. Clean with minimal markings. Always used in included hard leather case and strap. Case flap functional although does have portion that is split from age. Kowa SE-T 35mm Vintage Camera with Sun Telenet Model EE Lens SHIPS FREE! USD 159.99. Big 3 Gaskets 6-20700 Ford TK. V6 244 (4.01) Engine 1997-00 Conversion Set USD 169.99. Buy it now. 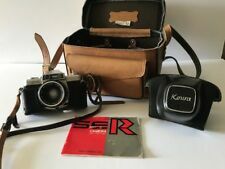 VINTAGE JAPANESE KOWA SE 35mm CAMERA AND CASE WITH f1.9 50mm LENS. Shipped with USPS Priority Mail. Wow! What a great find. 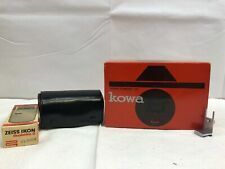 Vintage Kowa SET Camera set with (1) Koma Aux Telephoto lens, (1) Koma Aux Wide angle lens with leather case to store them, (1) Koma lens ring with leather case, (2) Koma lens, (1) big hardshell case to carry all the accessories and camera. This item is in good condition. Has not been tested. (A copy of the user's Manual will be included, leather case and lens cap). GRAFLEX CENTURY 35A, 45/3.5 KOWA PROMINAR, WITH WORN CASE, SHUTTER NON-FUNCTIONAL AND ONE BLADE DISLODGED, VIEWFINDER HAZY, AREAS OF OXIDATION, SOLD AS-IS FOR PARTS OR REPAIR ONLY, LOOKS EX. We want you to be happy. Interchangeable Lens. Battery not included. Pick up from Sydney available. Being sold AS IS, For parts or repair. This was aquired as part of on estate, This is untested, presumably not working. This is untested as I don't have a battery or any film. It is in good condition and the lens is free of scratches and has no fungus. Aperture leaves in the lens are misaligned and need to be cleaned and adjusted. kowa SE T camera No. 103564 No lens Used Damaged some buttons are missing Not sure if it works It’s from grandpas collection Please view photos before purchasing Please email for any questions. Professionelles Service Unsere Mitarbeiter/Innen leben Fotografie. Filtergewinde: 49mm. Objektive Autofokus / Lenses Autofocus. Objektive Manualfokus / Lenses Manual Focus. Gebraucht-Ankauf Wir kaufen Ihre Gebrauchtgeräte an. Kowa 3.2/28 mm. Mittlere Benutzungsspuren am Körper des Fotoapparats. Leichte und glatte Fokussierung. We are interested to keep you happy and will listen to all your remarks. This is the picture of the actual item that you will receive. Provided in untested condition has been in dry storage. Great for prop or display item. No reason to think it won't work again. Sich ein bißchen Zeit und schauen sich einmal um. Sie finden dort vielleicht ein Buch aus Ihrer Schulzeit, oder ein Buch für die. Die Kosten dafür teile ich Ihnen umgehend mit! Kinder oder Enkelkinder. Fixed Kowa 1.9/50 lens. The lens is a 50mm f1.9 with a 49mm filter thread. The finder features center split image to aid in focusing. KOWA MODEL .E. 35 MM FILM CAMERA. FAULTY. THIS IS A KOWA MODEL. 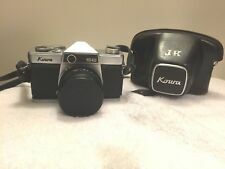 Vintage Kowa Camera With 2 Lens. Lens info is Kowa Optical Works, Japan, No 10119966, Prominar, 1:2, f=50mm. There is just what looks like normal dust/debris aswell when you look through viewer. Ø Filtergewinde: 49mm. Objektive Autofokus / Lenses Autofocus. Objektive Manualfokus / Lenses Manual Focus. Natürlich gibt es Exoten, wo auch wir uns den Kopf kratzen. Dann hören wir gerne auf Ihr Wissen.